This 1760s gown features a rose-red silk with trails of ivory flowers woven in a complex technique. 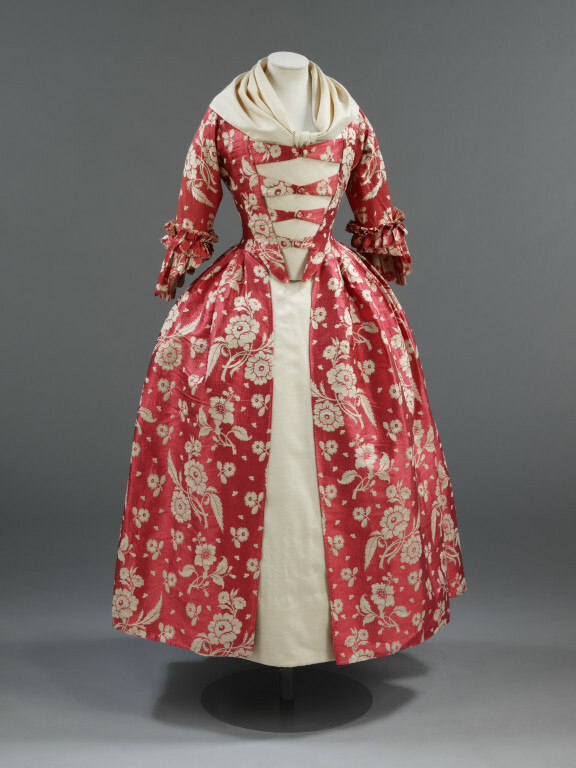 The fabric, a type of silk known as gros de tours, dates from the 1740s, but the gown itself has been remade into the style of the 1760s. Due to the great expense of silk, it was very common practice in the 18th century for women to remake and update their gowns. Gros de tours silks were luxury fabrics in the 1740s, costing between 6 shillings and twelve shillings per yard; a sack required some fifteen yards of silk. 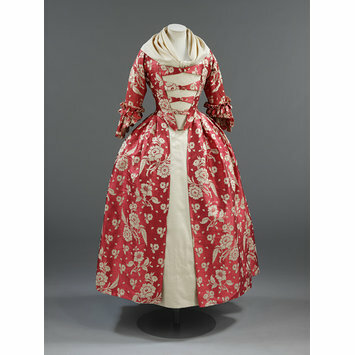 A woman's gown of woven in a complex weave with a white ground warp and weft, and supplementary pink weft, in a figured design of large and small floral sprays. The ground warp of white silk is woven in tabby and used for the flush effect.The binding warp is white silk, binding the pink pattern weft in a chevron twill based in a repeat of 4 ends, and binding the white ground weft in tabby under the flush effect. The pattern is created with complex binding, making it reversible with a strongly contrasting pattern, particularly effective on the sleeve ruffles. The gown is in the English (tight-back) style, open at the front with elbow-length sleeves and single, scalloped and pinked sleeve ruffles. The bodice robings extend to the waist, with four buttoned straps graduating in size,on each side of the bodice front. Each fastens with self covered buttons and worked buttonholes. The bodice and straps are lined with two types of inen. The pleats at the back are stitched down and the skirts flat-pleated into the waist seam. The gown is made of 6 widths of silk. A tape is stitched at the centre back waist. The gown has been altered at least once in the 18th century and the bodice relined. It may have been altered for a smaller wearer. The dress shields were probably added in the 1950s. The lace cuffs were removed during conservation 2007 and numbered T.433A&B-1967.